There is no doubt, riding or especially racing motorcycles, (yes even vintage machines) is somewhat dangerous. Most folks tend to see it as highly dangerous and lots have an example of injuries sustained from not staying on two wheels. 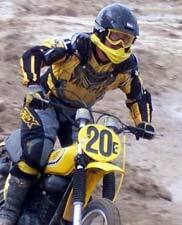 I think that after a person has been on a motocross bike and really ridden for extended years, they can become sort of complacent. We tend to get faster and faster, having a blast! You can be cruising along thinking positive thoughts and all of a sudden, the front wheel washes out while rounding the turn, your brake lever pins your hand to the bars and you’re tossed over on your shoulder and you hear a “snap”! You’re not really in any pain, it actually felt good, you ride the rest of the afternoon, stiffening more and more until it is hard to breathe! Some painkillers, some stretching, exercising while several weeks go by and you are all right. Riding and racing again, never missing any races. Then a fellow racer makes a huge mistake on a jump during the heat of battling for position in moto two, he don’t make the double that he probably should not have tried and shatters his fibula, tibia and ankle. You feel bad for your friend, your competitor, and your fellow motorcycle enthusiast. You’re gonna miss His talking around the pits, and helping push your old Yamaha. We all know the risks, and we have to be prepared for these type issues I guess if we don’t keep it real! I for one am a forty eight year old kid, but I still have to go to work on Monday (most of them anyhow). Most of us “vintage” racers are in this gig for the love of the sport, the adrenaline rush at the start line and while racing, the exercise and the camaraderie. You can’t enjoy those things at home on the couch all banged up. Even though I try to look like Pierre Karsmaker I will never ride to His level and I must keep that in perspective. I utilize the goal system to keep myself in check. I don’t want to fall or get hurt. Let me repeat goal five, I don’t want to fall or get hurt. That probably is the most important goal. In order to accomplish this task a lot of things need to happen. You must realize even though it is a race, and the objective of a race is to win, accomplishing all five goals is imperative. Winning a moto or a race, most likely won’t happen anyway if you don’t meet your goals, but it is not actually a goal. When I first returned to riding, I noticed the small aches and pains. The pulled or sore muscles from sliding all around the seat. The sore, sore legs, the forearm pump, lower back aches, I had them all. After about four races in that first season, I told myself I either need to quit or get in shape. I had lifted weights for several years in my younger days, so I dug up that old belt and gloves (1983 vintage), joined the gym and started a simple 45 minute routine, four days a week immediately after work using light weights and many reps while concentrating on form. This has been the single most helpful thing I did, increasing my strength in my arms, back and legs has greatly increased my ability to control the bike. I race with a lot of wonderful competitors in Florida. Many of these guy’s are racers who raced in the seventies and never really quit. Some have regular bicycle / exercise programs to help with endurance and swear by it. All of the regular riders that race in the Florida series are willing to help each other with parts, assistance, technical know how, so getting to the start line with a running bike is somewhat easier. There are no guarantees you will finish a moto but with those riding skills and a little luck your chances are much improved. Concentrating on what you are doing, while being well aware of the other riders around you is important, holding your line, staying controlled on either of the wheels are the challenges that makes racing a dirt bike absolutely thrilling. Every day you think about your responsibilities in life, your job, your wife and kids. We all have the stresses of every day life and motocross is a rush that clears the mind, and gets those juices flowing, but you have to keep it real! I hope the guy next to me has the same goals.